Sometimes, it's all in the approach. I have found that if I present an activity to my kids in a visually appealing way, they are on board! This is especially effective if I set it up as a surprise - they go to bed for a nap, wake up and ... oh, look! It's a painting station! I made these little table easels from a cardboard box, and they worked a treat. To make your own, get your hands on a long strip of thick (moving box) cardboard, fold into a triangle along the length, and tape in place. So ridiculously easy and effective. I actually have a table easel of my own, and I've used this version with the same ease. Eden got straight into it with her usual level of concentration. Eden was very focused on creating her art, and asked me to please stop 'dis-acting' [distracting] her by taking photos, so most of these pics are of Ava, who plunged in with gusto. 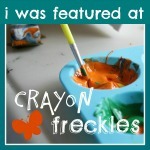 In anticipation of this, I used non-toxic paint diluted with water in case Ava decided to sample some (which she did! ), and egg carton bases as palettes which are sturdy enough to not tip over and also means less clean up at the end (cartons in the bin, no washing!). Fingers are just as good as brushes! We will be doing this again shortly, as we're still trying to get through the cold and rainy days, and this is a great indoor activity. Good thing I saved those easels!